What a doctor needs from their uniform changes as technology and medical tools continue to evolve. Five years ago there weren’t all that many iPads and tablets around; today they are nearly ubiquitous in the medical setting. They are incredibly handy tools that can be used for quick references, educating patients, and more. 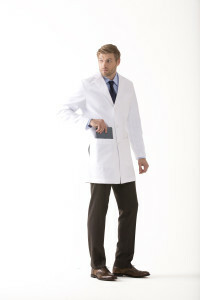 So what today’s modern doctor needs is a lab coat that has pockets roomy enough to hold their tablet or iPad. Having larger pockets frees up your hands so that you can carry your tablet with you during your rotations or consultations, without having to carry yet another thing along with you. But lab coats with iPad pockets are also useful even if you don’t have a tablet. The large pockets can hold anything you might need to carry around with you. This entry was posted in ipad lab coats, Lab Coats and tagged Design Details, lab coats on September 2, 2016 by Ariel Jacoby. There’s a national trend of going paperless in the medical offices and hospitals across the country. Luckily there are lab coat manufactures who recognize the need to accommodate doctors, nurses and other medical professionals who already useiPads and other tablets to keep medical records organized. Medelita was one of the first companies to see the opportunity and since they manufacture lab coats and scrubs themselves, they were able to make quick adjustments in the designs and introduced iPad Lab Coats in a variety of styles for the physician lab coats and clinician lab coats. The best women’s ipad lab coat available on the market is Emma W. Stunning design, one could even say it’s a fashion lab coat. It features modern style, exquisite detailing, 100% cotton fabric, tailored fit and takes advantage of the latest advancement in repel and release nano-technology. Have never seen such a good quality female physician’s coat – 100% thick cotton that drapes well and won’t rip, finished seams, attractive buttons that have been sewn on securely, and a really nice fit. Thank you. This entry was posted in ipad lab coats on October 19, 2012 by medelita.